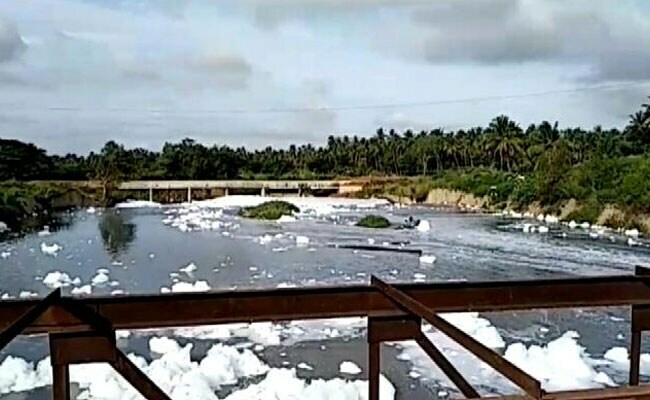 A lake near Karnataka Chief Minister HD Kumaraswamy's constituency on the outskirts of Bengaluru is releasing what villagers claim to be toxic froth as a result of dumping by industries. Farmers say the toxic waste is killing their crops. The residents complained that the authorities have not reacted as swiftly to the issue as they had when a lake in Bengaluru was found overflowing with toxic froth in January. The Byramangala lake in Bidadi, 40 km from Bengaluru, is receiving waste from expired medicines to paint to industrial effluents containing acid, the residents alleged. Pollution control experts, however, say dumping untreated waste into the lake is the culprit. "The biggest reason for this is due to the use of detergent powder in homes, which are dumped into the lake without treatment," pollution control consultant AA Purohit told NDTV. Other waste from the main city also reaches the lake, adding to the problem. The villagers alleged garbage trucks from the city come to the Bidadi lake to dump waste. The source of the lake's water is Vrushabavati river, which emerges in the heart of Bangalore city and later joins river the Cauvery near Ramanagara, the constituency of Mr Kumaraswamy. "We created a committee which has suggested some measures to stop it after investigation. We have given notice to everyone concerned. The committee will ensure that the instructions are followed," said Laxman, Chairman of the Karnataka Pollution Control Board. Environment activists say compared to the 'slow' response to the Bidadi matter, when Bengaluru's 1,000-acre Bellandur lake, infamous for pollution and toxic froth, caught fire in January, some 5,000 army personnel and fire-fighting equipment were rushed to control the situation in just seven hours. The areas in and around Bengaluru has several lakes than any other city in India. Environment expert say it is a major challenge to keep them clean as the city expands and untreated waste flows into them.